Work experience: the general experience is 51 years, the scientific and pedagogical experience is 48 years. What university, for what specialty and when he graduated from: Karaganda Polytechnic Institute, “Automobile Transport” in 1967. Academic degree, academic title, academic degree: Candidate of Technical Sciences in the specialty 05.22.11 – Automobile Transport, 1974, Moscow Automobile and Road Institute, Associate Professor in the Department of “Automobile Transport” 1977. From January 1968 to May 1968 he worked as head of production at the Ulyanovsk carpool of the Karaganda trust freight traffic. In May 1968, the translation was accepted by the assistant of the Karaganda Polytechnic Institute. In 1969 – 1970 academic year, he passed a one-year research internship at the Moscow Automobile and Road Institute. For a long time from 1974 to 1991, he worked as a dean by correspondence (01/15/1975 to 06/1982), preparatory (09/01/1982 to 01/09/1983), transport and road (01/09/1983 to 01/09/1987) faculties, headed Department of “Automobile Transport” (17.02.1987. to 26.08.1991g.). From 26.08.1991 to 12.04.1993 worked as deputy head of the association “Karagandaagropromstroy” on commercial issues. 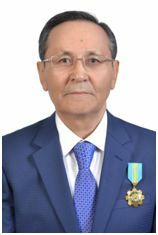 1994 to 1999 – Head of the Department of Karaganda Higher School of the National Security Committee of the Republic of Kazakhstan, from 06.1999 to 12.1999 – Head. department at the Kazakh-Russian University, from 01.15.2000g.po 2009. – Associate Professor of “Automobile Transport” KSTU, from 09.2010. till 2015 worked as a manager. Department of “Automobile Transport”, Director of the Faculty of Transport and Road, is currently Professor of Transport Engineering and Logistics Systems. Main research interests: research and development of scientific and technical foundations of improving the organization and road safety; study of the problems of improving the efficiency of road transport. 124 scientific and methodological works were published, including 1 article in the journal Scopus, 18 scientific articles in the writings, 7 articles – RISC, 2 textbooks with the heading of the MES RK, 2 textbooks with the heading of the MES RK, 3 monographs, 28 abstracts of the report, 1 invention , 3 SIS; 15 textbooks have been released. Items read in the academic year: “Organization and safety of road traffic”, “Safety and reliability of vehicles”, “Fundamentals of transport safety”. Contact information: 87014235240, slave. 564774, house. 421245.